The evolution of the GOLFSTR was 40 years in the making. Yes, I have been golfing for 40 years and have been shooting around 90 (and I hate to admit 100) for many years. My wife will never understand this but The Golf Channel has inspired me to understand the perfect swing and to figure out why I can’t hit the ball consistently with each swing. Near the end of 2010 I took a golf lesson with Lee Beauchamp, a Golf Pro at the Oakville Golf Club. The goal was to get my handicap under 20. His lesson pointed out my major flaw: The Dreaded Bent Leading Arm in my backswing. In my effort to pound the ball with all my might, I was swinging “over the top” and down at too steep of an angle to hit the ball consistently or correctly. Topping, slicing and hooking were all consistent results with my normal golf swing. The harder I swung, the more the leading elbow bent and the worse the result. Sound familiar? In the following video of that first lesson it clearly shows my inability to swing through a reasonable swing plane. My instructor, Lee Beauchamp, describes the problem as he reviews my swing in slow motion. This video of my 2010 golf lesson was my wake-up call to straighten my leading arm. This is sooooo embarrassing! My poor swing is magnified by my limited flexibility. This seems to be very common with many golfers, especially aging golfers. Undaunted I decided to overcome the bending elbow. As hard as I tried to keep a straight leading arm, I always find that I flex the arm for what I am hoping to be more power in my swing. No such luck. Somehow I needed to train my brain to stop bending my leading arm during the back swing. My brain knows what to do but if you are like me, the leading arm just keeps bending. I realised that I needed a product to help me learn to keep my arm straight. I was hoping that if my shots were consistently better, my brain might somehow rewire and allow me to keep swinging correctly. I first tied a tube around my elbow but that just eliminated my elbow flex in the follow-through and cut into my wrist and arm. I then tried a clicking elbow device but that just drove me crazy as well as everyone around me. It was just not practical to play 18 holes with a noise maker. I wanted something that was attractive, low cost and easy to wear for 18 holes of golf. NOTE: Training aids are not allowed in any competitive matches and would be discouraged where wagers are involved. I just needed a product which could be worn for many rounds of golf to prove to myself that I could drop my handicap by about 20 to 30%. Training my brain to rewire and allow me to do this consistently was the real goal. A flash of brilliance hit me as I lay awake one night trying to solve this problem. Going through the 5 senses of sight, hearing, taste, smell and touch I realized that touch would be the best to explore. 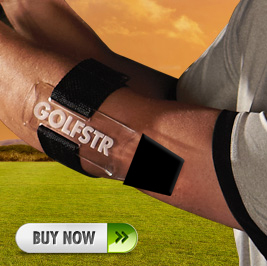 I noticed that touch on the back of the arm was very sensitive, so I evolved through many designs to create the GOLFSTR. As you hold your arm straight in your back swing, there is a light touch on the back of the arm above the elbow. As you bend the elbow, you can easily feel the change as the curved end of the GOLFSTR lifts off of the back of your arm.